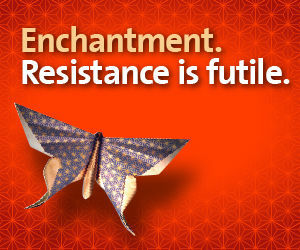 I just finished Guy Kawasaki’s Enchantment, which the sassy Suzanne Vara was kind enough to loan me. In a word, I found the book to be…. There are a lot of good things to say about this book. First, I would say that even though you, like me, may just know Guy via his Twitter presence, this is not really a Social Media book. In fact, I found the chapter dealing with Facebook, Twitter, LinkedIn, and YouTube to be the only major lull in the book. And how to avoid getting enchanted by things that can be harmful to you. The book is full of good advice, much of which is backed by short snippets explaining real-life examples. By the time I got to Twitter a year ago, Guy had gotten to that point on Twitter and in the Social Media world where it’s virtually impossible for a new person to engage. This book gave me a better idea about the person who is actually behind all of those crazy tweets! Quick read, actionable items, amiable writing style. Sounds pretty, I don’t know, enchanting, doesn’t it?